Caroline Burns sings ‘So Far Away’ on The Voice Season 10 Blind Auditions on Tuesday, March 1, 2016. “I remember you and no one turned around and look what you did today. Honestly, you are tremendous. The leaps and bounds that you improved, I am so proud that I heard it,” said Adam Levine. “I enjoyed your performance, you just like lifted the people,” said Pharrell Williams. “What extra special about you, you kept your composure this time around. You never had a pitch problem and for. 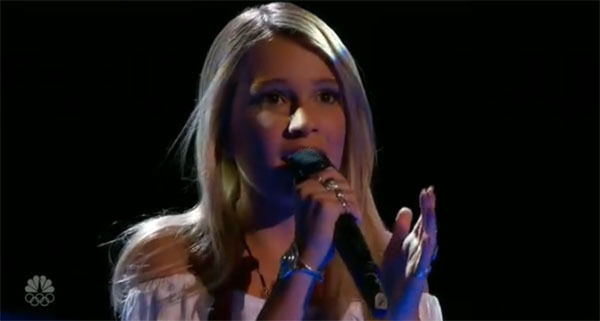 A 15 year old girl that can sing like that can easily win The Voice,” said Blake Shelton. Caroline Burns pick Team Adam. Watch her performance on the video below.